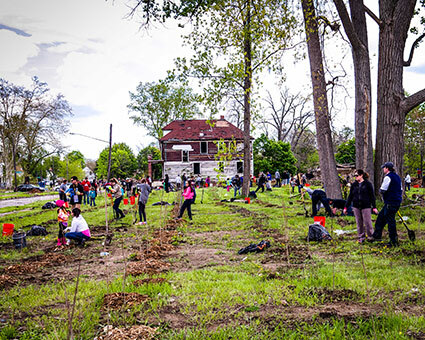 DETROIT — Building on the success of last year’s Planting Day, Hantz Woodlands will plant an additional 5,000 trees, expanding one of the nation’s most extensive urban reforestation projects in May on Detroit’s east side. Hundreds of volunteers, businesses, neighborhood groups and other organizations have already signed on teams of people to plant. Registration on the day of the event takes place on the corner of Fairview and Goethe. This year’s goal of planting 5,000 4-6 foot tulip poplar trees includes activities for the entire community with narrated bus tours and shuttles across the entire Hantz Woodlands footprint. A back pack leaf blower croquet competition provided by Hellebuycks Power Equipment will also be on site. Last year, more than 1,400 volunteers, including teams from Carhartt, GreenStone Farm Credit Services, AgriBank, The Hantz Group, Bassett & Bassett, Debuck Construction and Alta Equipment participated in kicking off the first-ever planting day for Hantz Woodlands. In just over two hours, more than 15,000 trees were planted. This year’s event will be at 10 a.m. May 9. Hantz Foundation, Credit Union One, Detroit Bike City, and Future Farmers of America are joining as sponsors this year. Detroit Bike City is sponsoring a bike valet for participants who would like to bike to the site and explore the Hantz Woodlands footprint on two wheels. Hantz Woodlands has continued to maintain and beautify the more than 1,500 lots purchased from the City of Detroit in October 2013, with the aim to make the east side neighborhoods places where people would want to live, invest and play. Hantz last December was awarded a Certificate of Achievement from the city of Detroit and Mayor Mike Duggan for exceeding their goal in the planting of thousands of trees and the removal of more than 54 blighted structures. To register for this year’s planting day, all volunteers are encouraged to visit the Hantz Woodlands website at hantzfarmsdetroit.com/planting_day2015.html. Planting begins at 10 a.m. and will continue until 5,000 trees are planted. Holes will once again be pre-dug and prepared for planting. Volunteers will only have to put the tree in the hole and cover it with dirt. Participants are asked to bring shovels, as equipment is limited. Hantz Farms will provide volunteers with a complimentary BBQ lunch and beverages on site. There will be complimentary parking next to the site.